In Central Park, the Turtles are doing a routine “hide and seek” exercise. Mikey whines that they never find Splinter before he finds them and that the whole exercise is futile. The Turtles then stumble upon a drunken man on a park bench. As he comes to, the Turtles disappear. As the young man awakens and takes a swig of his booze, he is startled by Splinter. Rationalizing that the giant rat is just a drunken nightmare, he proceeds to have a conversation with him. Splinter asks why he has become what he has become. The young man explains that he dropped out of high school because he never learned to read. He’s a carpenter and tries to get work when there’s no written exam requirement, but he’s just too stupid to make anything of himself. 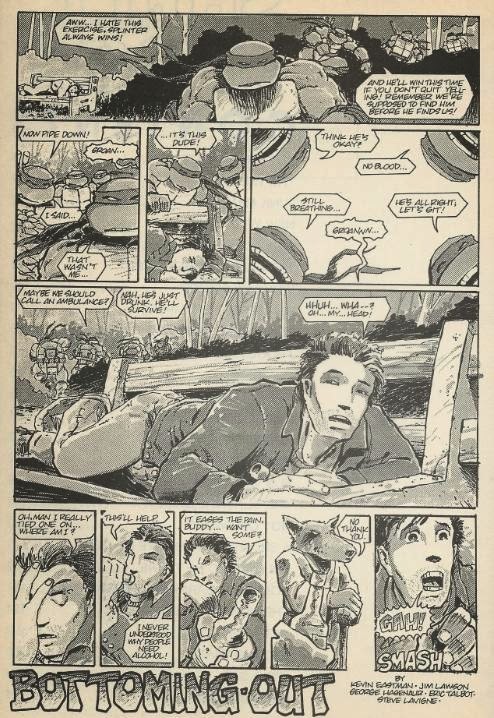 Splinter assures him that he is not stupid, but the young man disagrees. Splinter then places a hand on his head to show him the battle waging inside his own psyche. 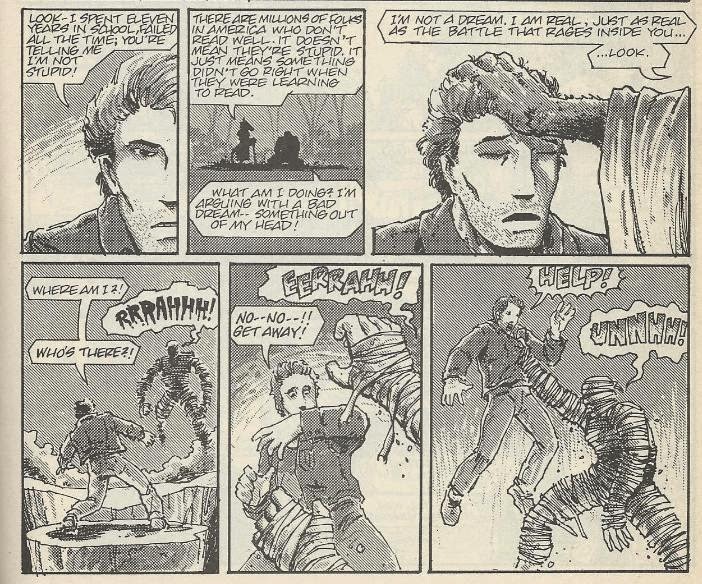 The young man suddenly finds himself attacked by a snarling, bandaged-up monster. The monster removes his bandages to reveal that he’s a mirror image of the young man; a representation of all his failures. The young man fights back, battering the monster with a branch and shouting that he’s not a failure. The young man returns to the waking world and Splinter tells him that if he beat his failures once, he can do it again. The young man asks how and Splinter describes several adult education programs to him. As the young man ponders this, Splinter vanishes. Elsewhere in the park, Mike’s whining again, saying that since they can’t win they should just give up. Splinter’s voice then echoes to them, telling them never to give up just because a task is too hard. The Turtles are filled with a new resolve and continue with their exercise. As Splinter observes his sons doing so, he also observes the young man triumphantly returning home, determined to try his hardest to defeat his failures as well. *Created especially for the “Shell Shock” trade paperback as the book’s lead-in, the story illustrates the purpose of the trade, 20% of the profits of which were being donated to the Literacy Volunteers of Chicago. According to the blurb on page 223, the main character of the story was “based on a number of real students at Literacy Volunteers of Chicago”. “Bottoming Out” is one of the preachier Mirage stories, though you can’t really blame it. The story was written for a book specifically crafted to earn money for a literacy program to help people in exactly the same situation as the young man in this story. The purpose of the project was a generous and philanthropic one and I applaud the Mirage crew for putting something like it together. At only four pages, it’s a short tale that gets to the point. I can’t really say if it’s good or bad; it just is what it is. To the creative team’s credit (the staff list doesn’t say who did what), they milk some action out of what would otherwise be a pretty mundane “adventure”. The young man’s inner conflict is realized well, though at first glance I thought the mummified embodiment of his failures was the Rat King. Anyhow, there’s a good moral here, even if it isn’t very subtle. The story’s meant to reach out to people who can help those in need, rather than the ones who are actually in need (the book was assembled to fight illiteracy and I don’t think the illiterate are going to be reading this). There’s really nothing much to say about this and nothing much to grade, either. Yeah, this one literally made me bust out laughing.